We woke up early today and prepared for a much different day than yesterday. Yesterday was action packed – a good thing for many of us busy bodies on the team. I couldn’t help but feel a little bit defeated this morning. We did wonderful things yesterday and planted seeds of hope and joy in many people. But as I prayed and thought about our day, I couldn’t help but feel defeated by the life that these joyful Haitian children will grow up in. We worked hard all day and came home sweaty and tired, but how much long-term impact can delivering water to a couple hundred people really have when they grow up in this cycle of poverty? Day 4 began with a 45 minutes tap tap ride up to the city of Titanyen to Healing Haiti’s Grace Village. 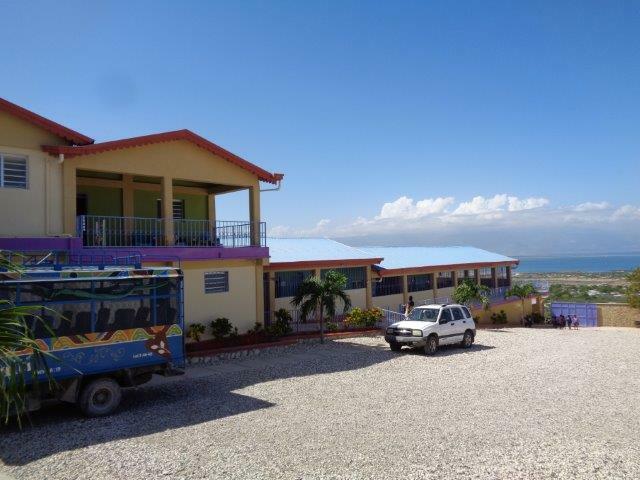 Grace Village is a school and orphanage built by Healing Haiti to educate and house both local kids from the community and kids who have been orphaned. We met with Kiki who gave us a tour of the village. 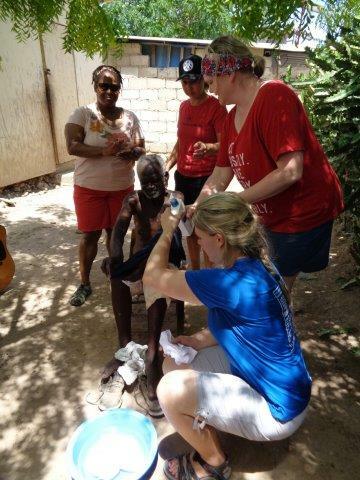 As we have seen all week, Grace Village is operated by local Haitians. With a 70% unemployment rate in Haiti, it is important for the sustainability of any organization to empower their people and make them a part of the process. Everyone from the teachers, house mamas, gardeners to the medical staff and bakers at the brand new bakery, are local residents. Fleri – the Creole word for flourish and also the name of the new bakery attached to Grace Village that represents the hope and promise of the Haitian community. There is hope for the children who have been orphaned to Grace Village to flourish, be educated, know Christ and go back into their community and continue to flourish. There is hope for the people of the community who now, thanks to Healing Haiti and Grace Village, have hundreds of new employment opportunities that weren’t previously there so they can flourish and provide for their family. Following Grace Village, we stayed in Titanyen for elder visits. Paralleling a program similar to the American Meals on Wheels, Healing Haiti also has an elder care program. We delivered a hot meal, care package and water to four different elders in their homes. 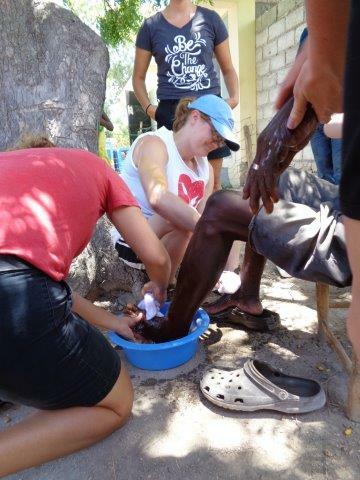 Many asked to have their feet washed and their arms and hands massaged. 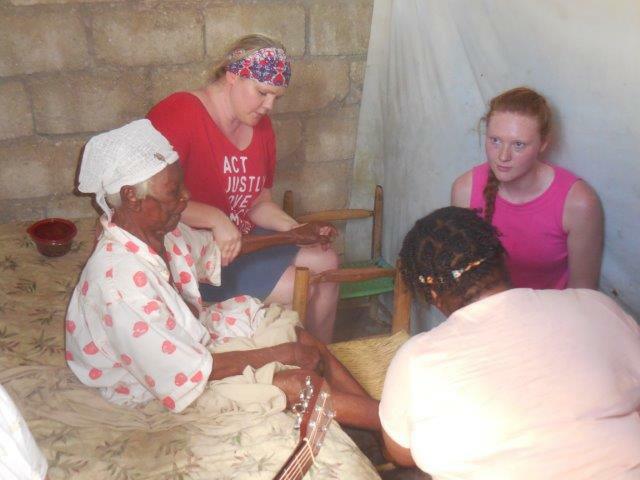 We were thankful to bring along Healing Haiti’s full time missionary, Grace, who led us in some incredible worship with the elders. Our first visit was to 91 year old Izna who was alone in her home. By the second song we sang together, (the first time in English and the second time in Creole), in Izna’s one room tin shack, there was not a dry eye in the room. Presence. The Lord has been so present in so many different ways on our trip and it has been a blessing to witness. One of our team members, Tammy, explained to us the presence of Jesus she felt in that moment was nothing she’s ever experienced before. A woman of 91 years old who couldn’t get out of her bed, but asked to dance and sing upon our arrival. Our second elder visit was to Diefort and his pet pig Pasyans, which means Patience in English. Diefort was the proud father of four and grandfather to many. As we washed his feet he asked us to pray for a pig mate for Pasyans and lots of piglets. In case it ever comes up at Thursday night trivia – Haitian “law” says if you have a litter of pigs born you have to give one back to the owner of the pig that fathered the piglets. What great beauty there is in a Haitian man who has been through so much in his life who continues to laugh, sing and smile in our presence. Our third elder visit was Gerard, the proud father of ten children. Gerard sat outside his little cement home built by missionaries with his daughter and granddaughter inside. His granddaughter came out shortly after we arrived and joined us for our worship songs. 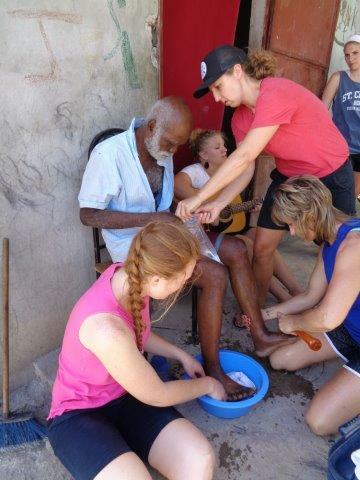 She had her nails painted while her grandfather had his feet washed. Though our actions seem so insignificant we find hope in knowing we are planting seeds that God will harvest. We gave his granddaughter hope and joy. Our last elder visit was to Lindor. When we arrived he already had his shoes off and shouted to us that he was ready to have his feet washed! Along with a back and hip massage. Lindor had an exuberant smile that radiated his joy. 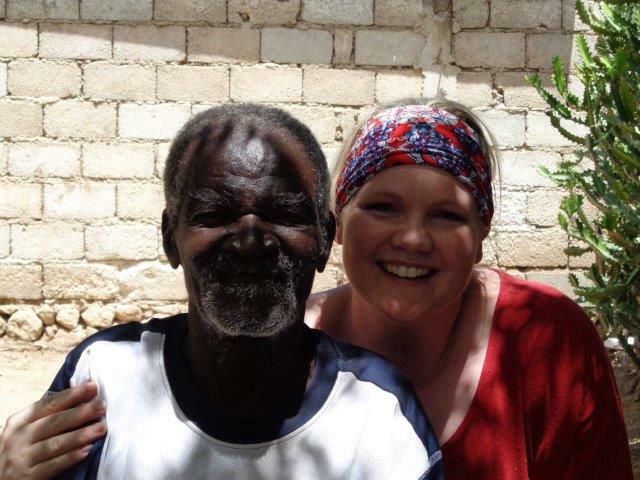 Shout out to team leader Amy and her grandmother who sponsor Lindor’s medical care via Healing Haiti. By the end of Lindor’s visit there were ten school age children who had gathered around to have their finger nails painted. A few lucky team members got beautiful ‘manicures’ from the children as well. 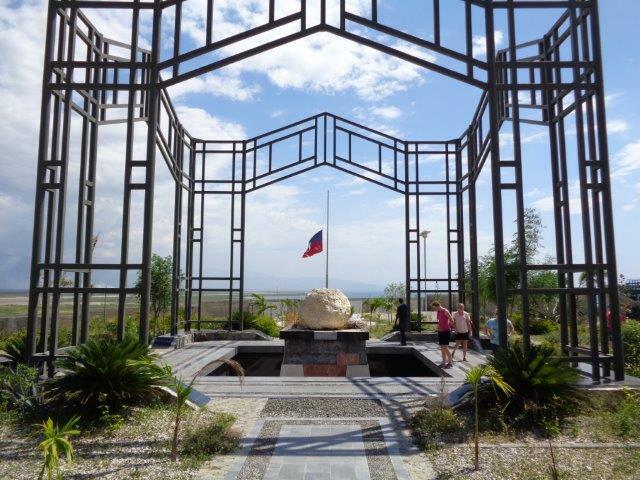 The last stop of the day was at the mass grave constructed into a monument for the hundreds of thousands who were killed January 12th, 2010 in the earthquake. 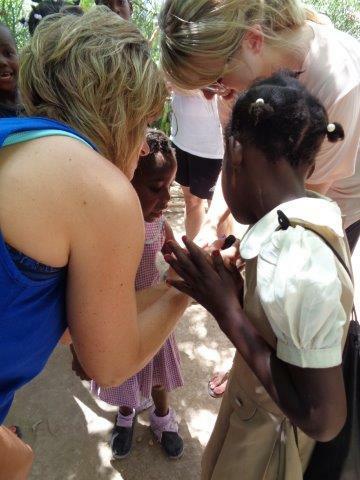 It was a solemn moment but explained so much about how Haiti has become the community it is. The Haitian people are so full of joy and pride in their country – it is the culture that makes Haiti such an amazing place. And we are so blessed to be a part of that. 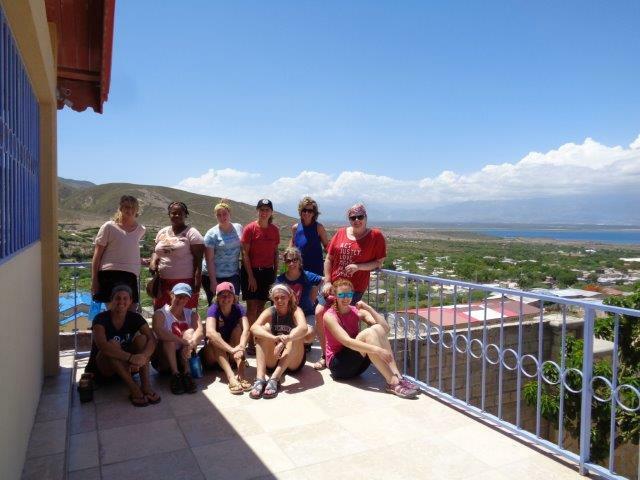 Bon nwi from Alyssa, Jill and the rest of the team in Delmas, Haiti.